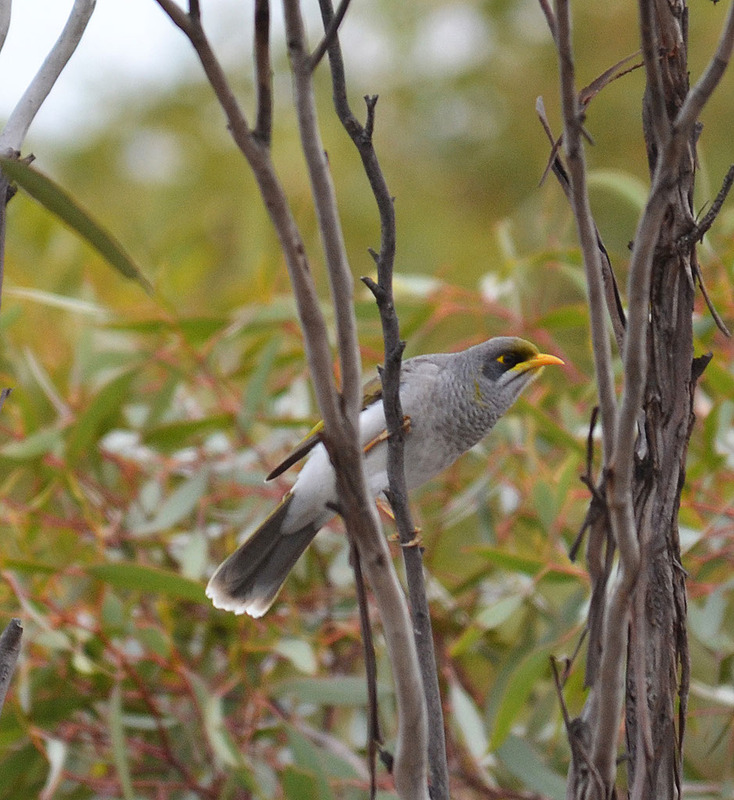 This report covers a winter trip (early July) to Birds Australia’s Gluepot Reserve. 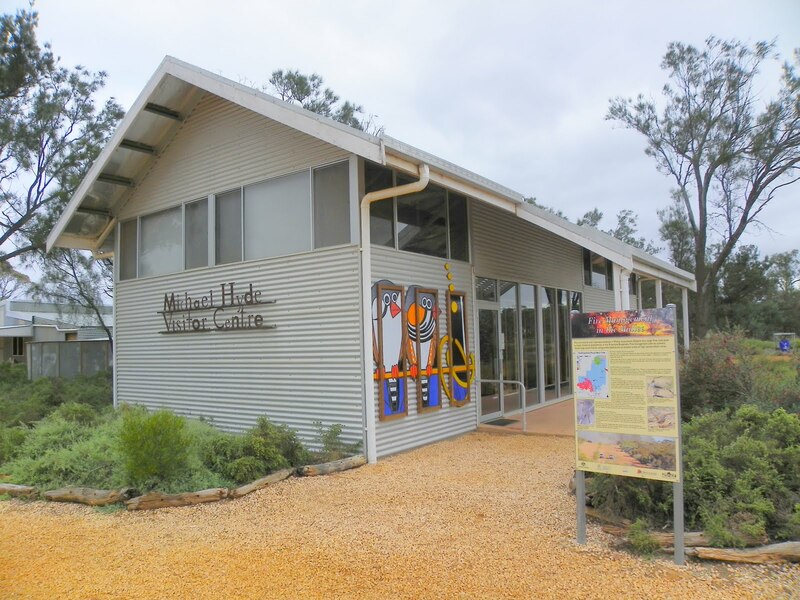 Part of the Riverland Biosphere Reserve on the South Australia and NSW border, it is located in the centre of the largest block of intact Mallee woodlands in Australia. 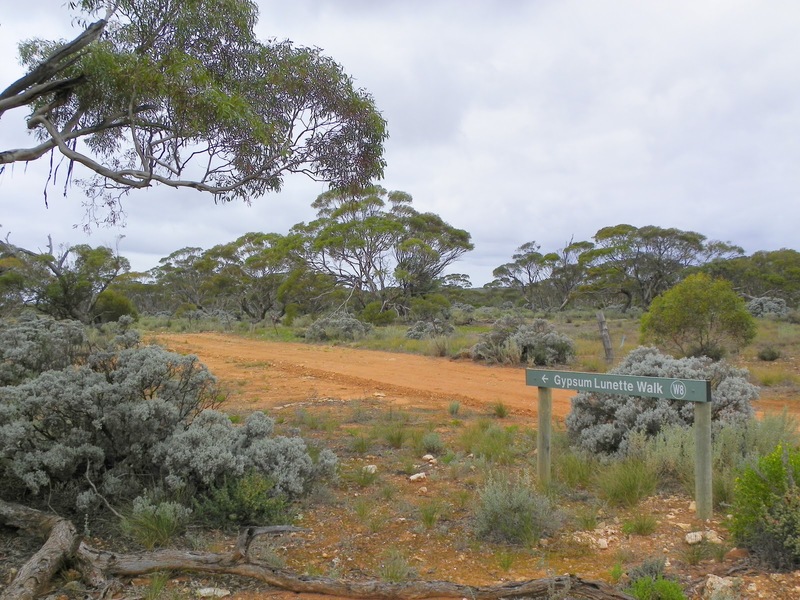 On the way home from Gluepot we stopped at Billiatt Conservation Park, another Mallee reserve 150 south of Gluepot. 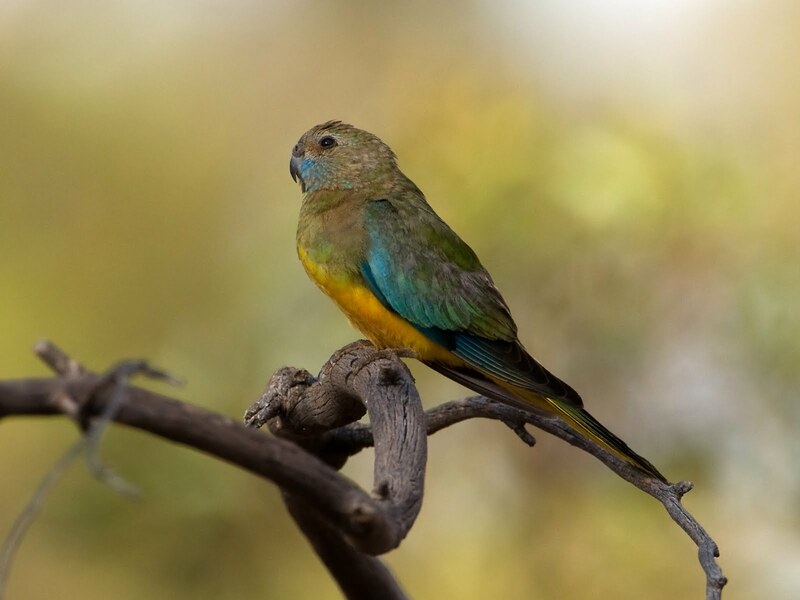 BIG thanks to Greg Oakley for the use of some of his images in this report, Kay Parkin for her Red-lored Whistler images, Sandra Wallace and Ian Montgomery for the use of their Scarlet-chested Parrot images. To see more of Ian’s superb photography visit Birdway at http://birdway.com.au/. Despite being the middle of winter I somehow managed to convince a couple of friends of mine – Greg Oakley and Fiona Parkin – to join me, with a vague (but obviously convincing) promise of seeing Scarlet-chested Parrot! Being a mid-winter trip I was also interest to compare the birdlife on the reserve with previous spring visits. Gluepot’s located 64 km north of Waikerie. The turn-off to Gluepot is from Morgan Rd, 30 km east of Morgan, 84 km west of Renmark (17 km north Waikerie). The Reserve is signposted – from Morgan Rd travel 1.5 km to the first gate and follows the signs. The last 50 km into the reserve is via a well-maintained dirt track traversable by conventional 2WD and caravans, although I’d recommend AWD or 4WD, particularly after rain. 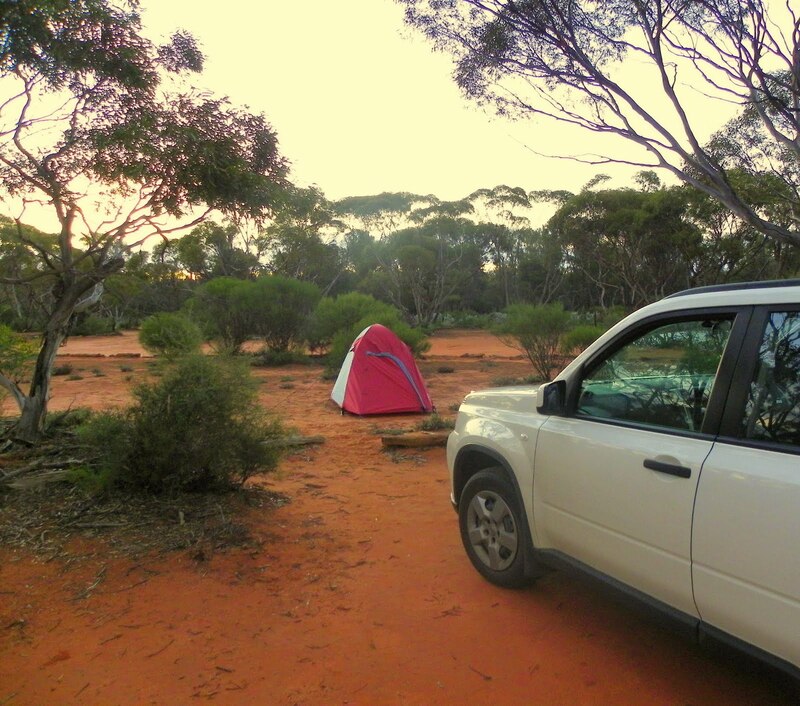 While at Gluepot we camped at the Babbler Campsite, 3 km east from the Visitor Centre. No wood fires are permitted on the Reserve, not good if you’re visiting in Winter! Although we brought in a little gas heater (which attached the top of a gas bottle), perfect for cold evenings. When visiting Gluepot you also need to be self-sufficient, bring in all your water and food.There is an entry fee of $5 per day per vehicle, campers $10 per night per vehicle. Another thing worth noting is that Gluepot’s located in a fruit fly control zone (linked to the Riverland district). There’s a checkpoint at the South Australia border, where you’ll have to discard all our fresh fruit and vegetables. Here we quickly ate most of our apples, and then restocked in Waikerie. On the way up to Gluepot the signs were looking good for some good winter birding. 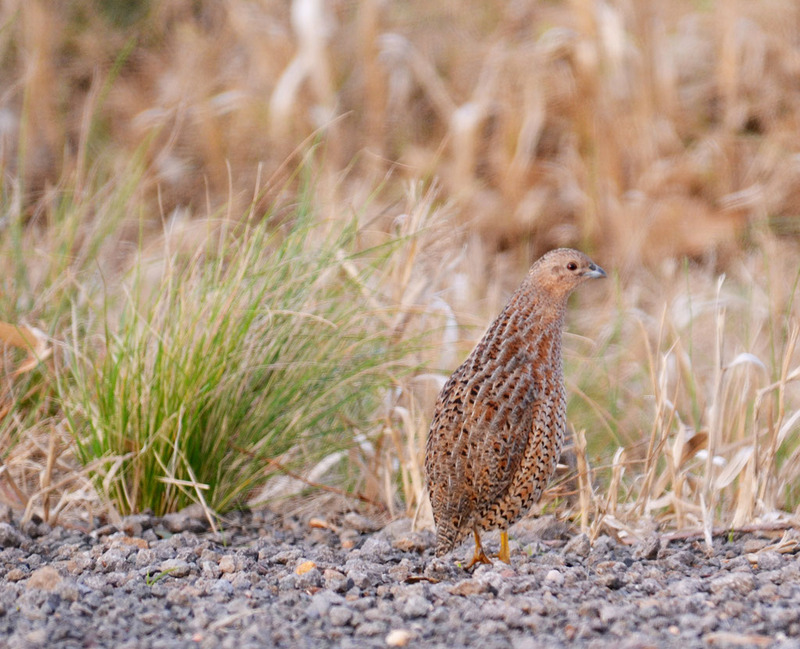 Near Wycheproof we came across a flock of 15 Brown Quail feeding on the roadside. 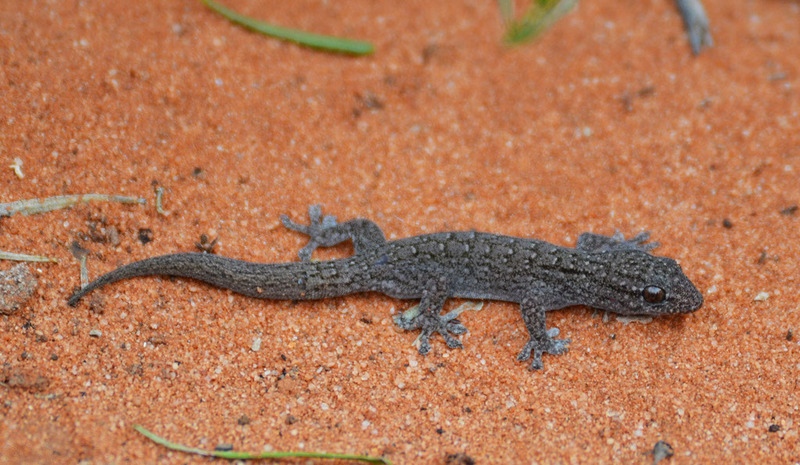 It’s been a great year for this species with a very high report rate across south-east Australia. A stop-off at Terrick Terrick National Park produced large number of open woodland birds, include large numbers of Rufous Songlark – a species that usually migrates north during winter. In an area just south of Reigal’s Rock we counted at least 20 birds. We also got onto Spotted Harrier, another migrant that usually heads north during winter. As you drive further north the Yellow Rosella start to disappear, to be replaced Australian Ringneck (‘Mallee’ race barnardi), Blue Bonnet (yellow vented race haematogaster), and Mulga Parrot. A particularly good spot to see these parrots is a cattle drinking tray about 10 km from the turn-off. 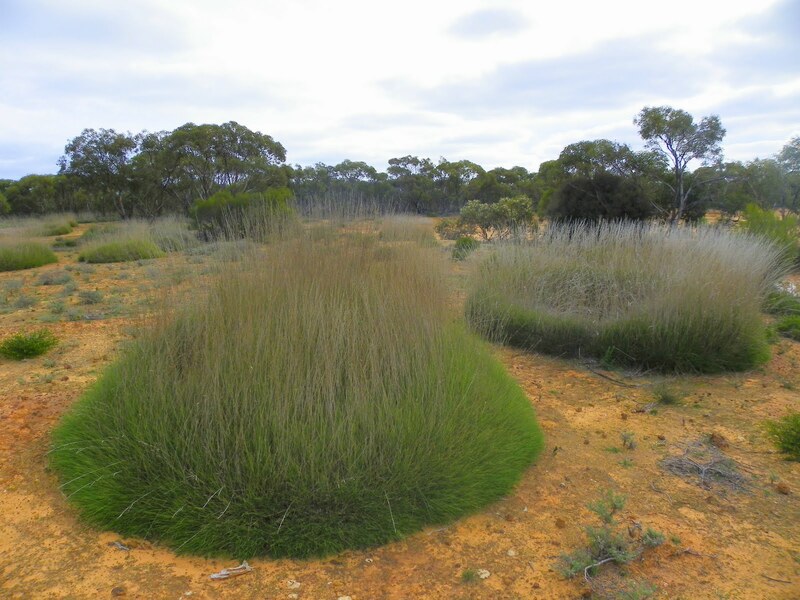 Once you reach Taylorville Station and then Gluepot, the habitat starts to become pure Mallee. The roadside along here is perfect for Chestnut-quail Thrush. I’ve never failed to see them on the way in, usually running into the bush from the roadside. On a trip to Gluepot in 2001 I remember seeing 6 Quail-thrush before I’d reached the Gluepot’s Information Centre. Also along the track you can also see Emu, Western Grey Kangaroo and the odd Red Kangaroo. One of the great experiences at Gluepot is waking up on a sunny morning at the Babbler Campsite after a cold night. During the night the temperature dropped to an impressive minus 5 degrees celsius! Our tents were completely covered in ice. Fortunately I’d planned for this. I deliberately packed two sleeping bags and two self-inflating air mattresses. During the night I was actually warm. 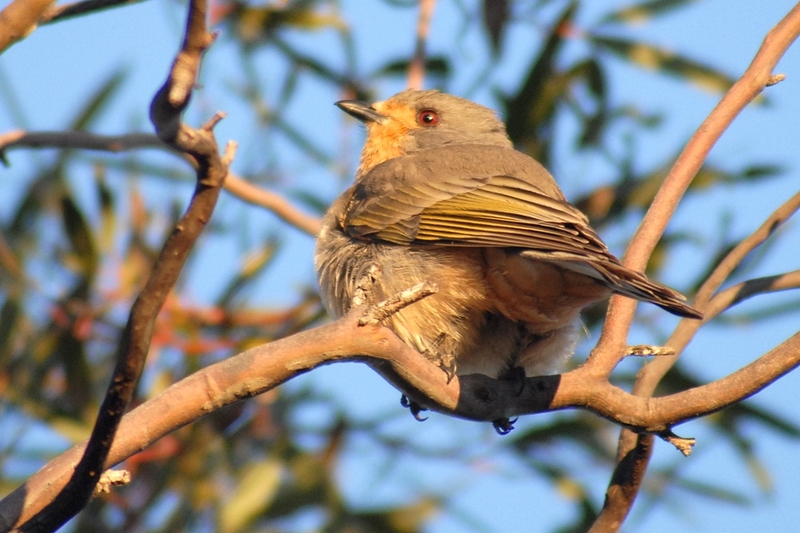 The open woodlands around the Babbler Campsite provide some of the best birding at Gluepot. There are two walks from the Babbler Campsite – a south walk and north walk. 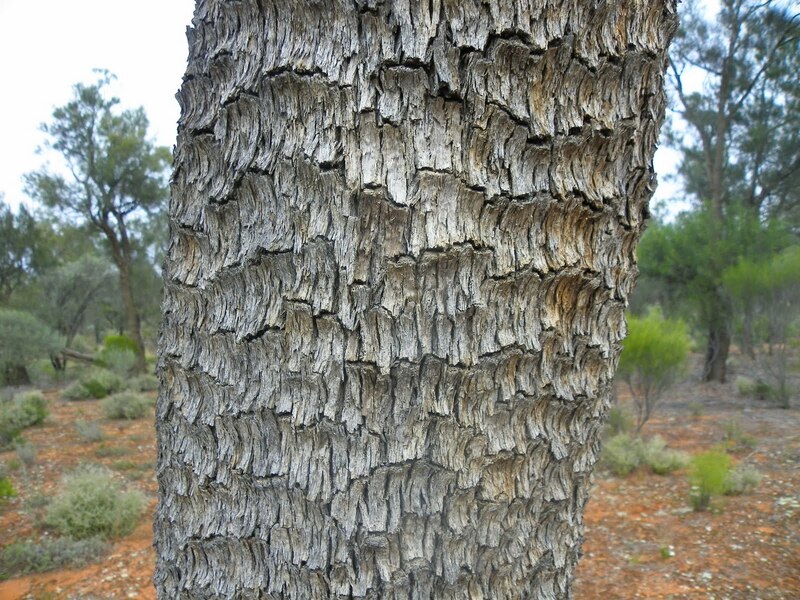 Many of the arid woodland species that are uncommon at other areas of Australia are surprisingly common at Gluepot – testifying to the wilderness quality of the reserve. This is particularly evident along the South Walk. In one particular spot, just 200 metres from the campground, we had a mixed-species feeding flock of Gilbert’s Whistler, Crested Bellbird, White-browed Treecreeper, Chestnut Quail-thrush, Splendid Fairy-wren (with a male in full breeding plumage, unusual for this time of year), Red-capped Robin and Chestnut-rumped Thornbill. Not bad. Further, all these birds showed no sign of being particularly shy, and we could have birded with them for as long as we wished. Other birds seen around the Babbler Campsite included Inland Thornbill, Hooded Robin, Grey Butcherbird, Grey Shrike-thrush, White-browed Babbler, Jacky Winter, Grey Butcherbird, Brown-headed Honeyeater, Pallid Cuckoo, Restless Flycatcher, Hooded and Red-capped Robin, while Regent and Mulga Parrot flew through the campsite itself. Nocturnal birds at the campsite included Southern Boobook and Australian Owlet-nightjar. Although not recorded on this trip, around the campsite I’d previously recorded Chestnut-crowned Babbler, Black-eared Cuckoo and Spotted Nightjar. 1. The darkness of the rump – the darker the rump, the less hybridization. It is worth noting that the local Yellow-throated Miner is often referred to as White-rumped Miner (race flavigula). I’d seen Black-eared Miner at the T-section on my first visit to Gluepot. At the time I wasn’t actually looking for them. I’d parked here to walk south along the Birdseye Border Track to look for Striated Grasswren. After getting some excellent views of the Grasswren (at one point I was surrounded by 4 birds, only several metres away, and all calling), I returned to the T-section only to find a flock of Black-eared Miner sitting in a tree above where I’d parked the car. The area around the T-section has since been burnt out in fire in 2006. However the Black-eared Miner are still here. On this trip we saw a flock of 20 birds plus, most of which were hybrids. 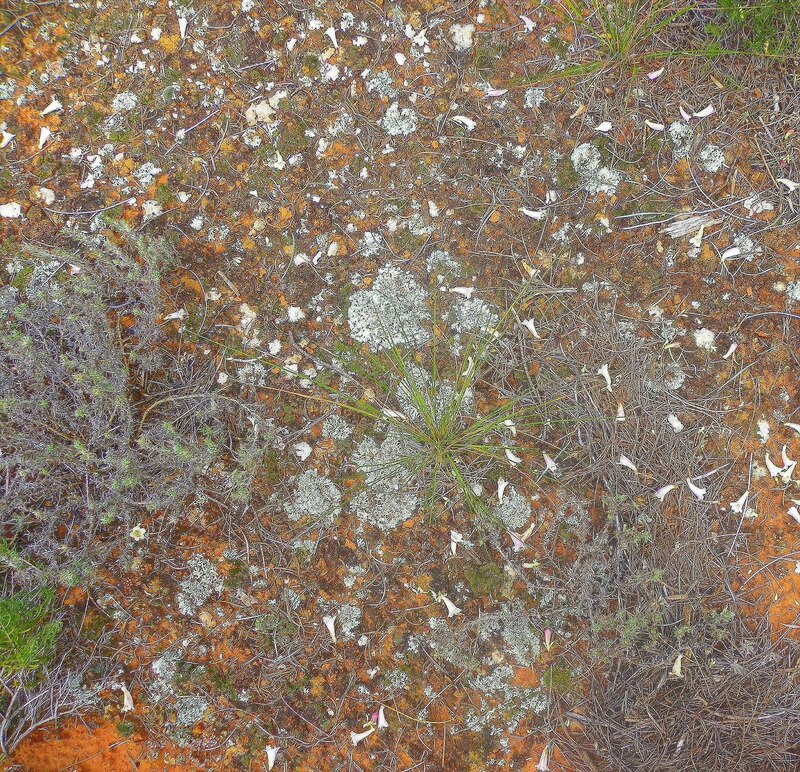 Along the Malleefowl Walk, which walks south from the T-section, look in the larger clumps of Spinifex for Striated Grasswren. Halfway along the walk there’s a seat to view a Malleefowl mound. The end of the walk is also reliable place to see the Red-lored Whistler, favouring the low mallee on low sand dunes. 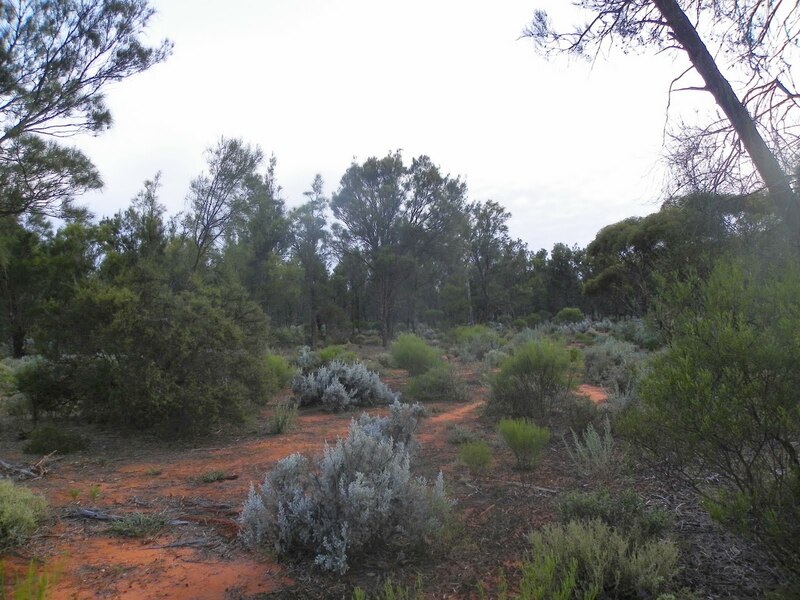 One of the best areas of Mallee bushland at Gluepot is north of Track 8, particularly the area just north and northwest of the T-section. 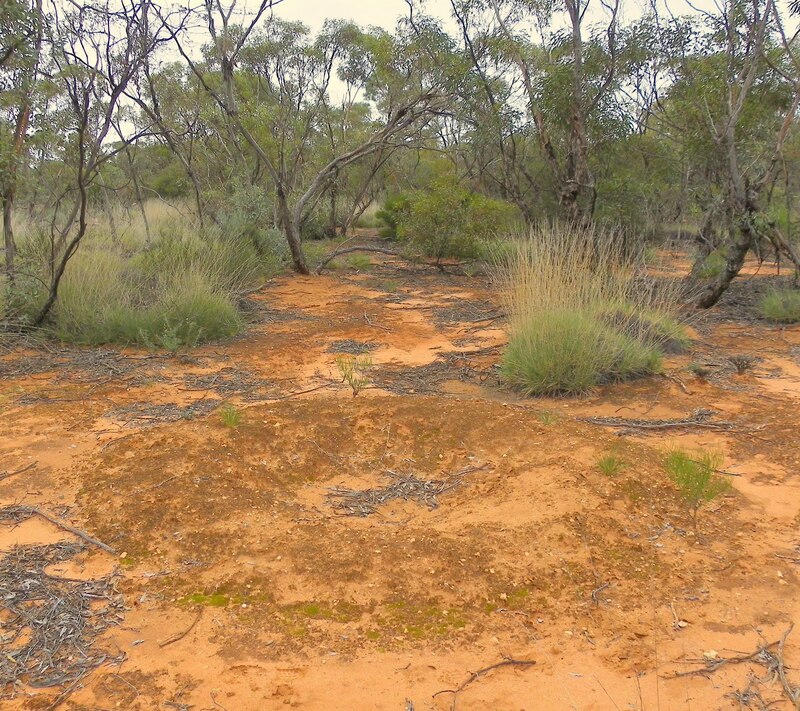 A good way to access this area is via the Birdseye Border Track, parking between the T-section and Grasswren Tank. Stop on the any of the decent sand-dune ridgelines that runs east to west (there’s a nice dune about 700 m from the T-section) and then walk west into the Mallee. The best birding is about 500 metres in from the track, where the main trees are White Mallee (Eucalyptus dumosa), Red Mallee (E. oleosa), Yorrell (E. gracilis) particularly on the brown soils, and on the sand dunes Ridge-fruited Mallee (E. incrassata), and there is a nice understorey mosaic of Spinifex (Triodia scariosa scariosa). Don’t forget to take a compass and water – you don’t want to get lost here. With a relatively open canopy, the bush here exhibits a post fire age of at least fifty years, perfect habitat for rare Red-lored Whistler. We got onto one (perhaps two) Red-lored Whistler. When we approached, the bird (s) came in for a quick look, and then disappeared. Pretty standard behaviour for Red-lored Whistler. Every other time I seen Red-lored Whistler they’ve behaved in exactly the same way. A brief appearance, and then gone. Other birds recorded here were Yellow-plumed Honeyeater (the most common birds on the reserve), Brown-headed Honeyeater, Jacky Winter, White-browed Babbler, Inland Thornbill, Weebill, and we came across a disused Malleefowl mound. 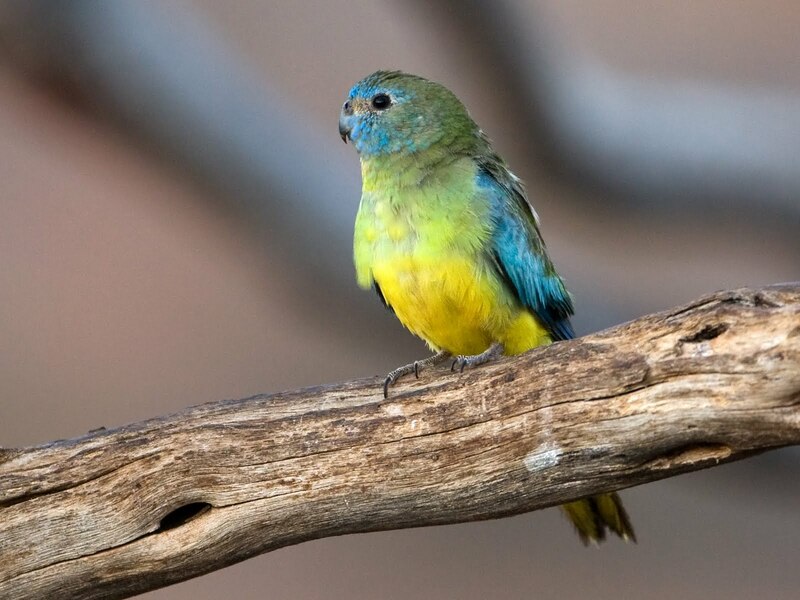 A major part of my logic for visiting Gluepot in winter was the possibility of seeing the extremely rare Scarlet-chested Parrot, a potential new life tick for me. It wasn’t good logic i.e. 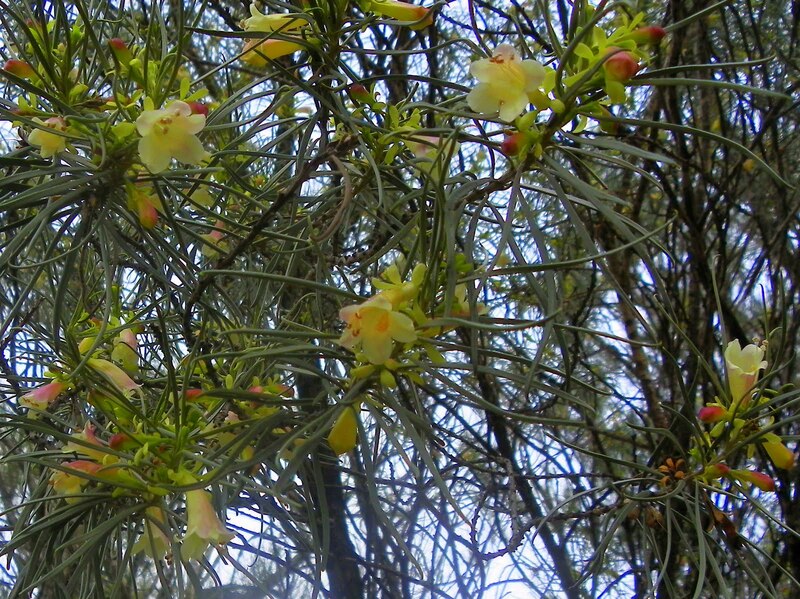 visiting Gluepot on the smell of an oily rag in winter to see Scarlet-chested Parrot, but at least it was logic. I had also planned to visit Danggali Conservation Reserve, north of Gluepot, where the chance of seeing Scarlet-chested Parrot was probably slightly higher, however the road from Canopus Dam to Tipperary Hut (where they’re occasionally seen) was closed. We were fortunate to see a large flock of approximately 20 Scarlet-chested Parrot, mostly immature and female birds, with a couple showing reddish coloring on the chest. 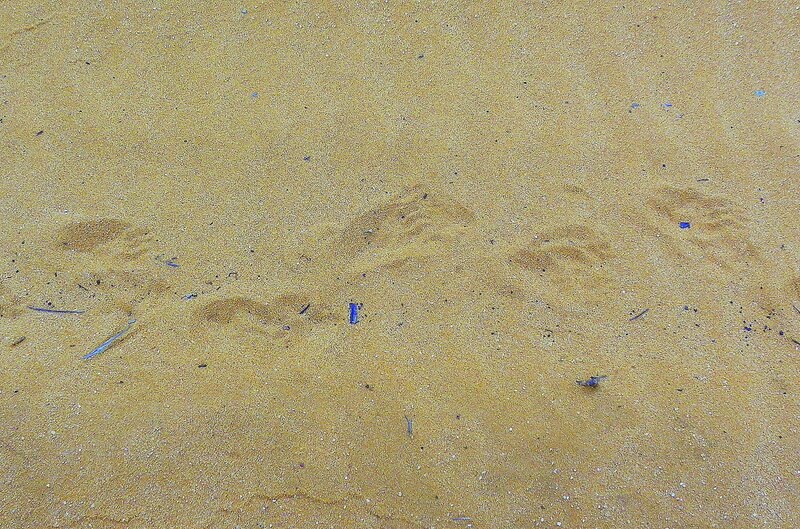 We got these on a track east of the Information Centre. As mentioned, they’d also been seen at Gluepot three weeks earlier, however the observer had informed me that he’d looked for them many times since and they’d obviously left the area. While driving to through Gluepot I said “What we need right now is a large flock of Scarlet-chested Parrot on the road directly in front of us.” A minute later a large flock of Scarlet-chested Parrot came screaming down the track directly in front of us, and then flew around the car, some so close that I had to check the grill to see if we’d cleaned any up. 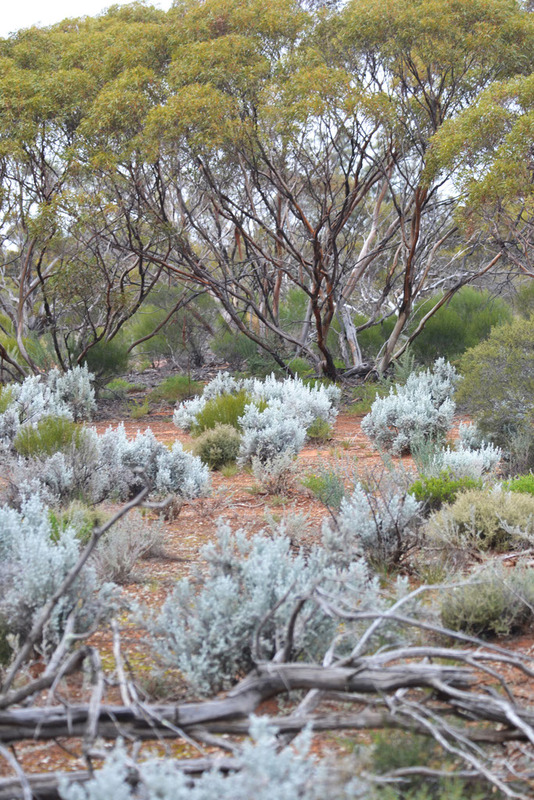 Gluepot Reserve – currently the landscape is dominated by succulent plants. 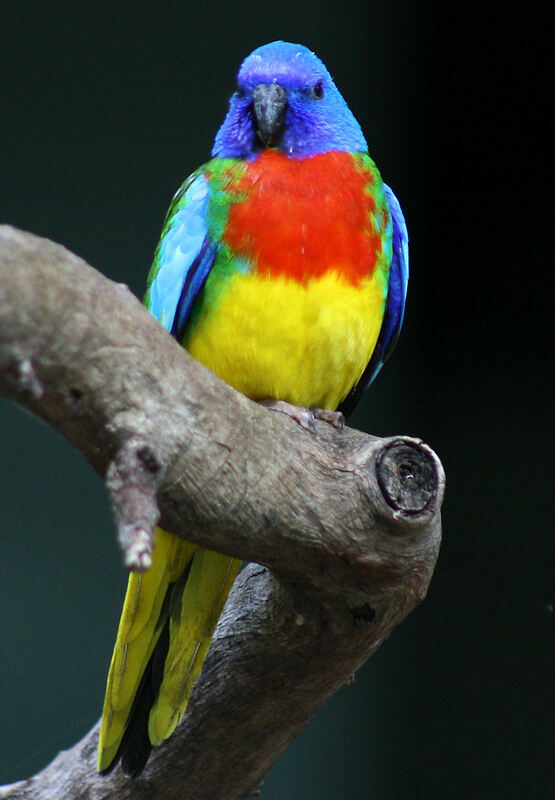 To meet much of their fluid requirement Scarlet-chested Parrot has been linked to a number of plant species such as the succulent Broad-Leaf Parakeelya (Calandrinia balonensis), a plant found at Gluepot. Interestingly the succulent doing well at Gluepot at the moment is a Grasswort species – not only dominating Mallee landscape at Gluepot, but also across much of the Murray-Sunset and Hattah-Kylkyne. I’ve never noticed this plant before, and as yet I haven’t been able to identify it. My feeling is that the Scarlet-chested Parrot are feeding on this plant, possibly explaining the large flock at Gluepot. The other thing I noted about the Scarlet-chested Parrot was their call. As they flew past the car I noticed their call was quite unlike any other Neophema I’d heard, the closest being Turquoise Parrot. There was no tsiting or buzzing. Their call was a far-more mellow tweeting. This surprised me. When I’d looked for them previously I’d been listening for a classic Neophema call. It may well be there, but I certainly couldn’t hear it. There are a few walks that I didn’t do on this visit that are worth mentioning here. The Whistler Tank Walk (about 6 km long – so give yourself time) commences from the car park on Track 8 (1.5 km from the Visitor Centre). It takes you through a range of habitats including Mallee with an understory of Spinifex, Black Oak, and stands of Senna and Acacia. Keep a look out for Striated Grasswren, Chestnut Quail-thrush, Southern Scrub-robin, Chestnut crowned Babbler, White-browed Treecreeper, and Spotted Nightjar (sometimes flush along the track). A hide (at 2.5 km) overlooks a watering point provides an opportunity to see birds such as Regent Parrot, Gilbert’s and Rufous Whistler, Striped and Pied (nomadic) Honeyeater. This walk is usually regarded as best place to see Scarlet-chested Parrot; look for them being around the carpark area near Whistler Tank. Around the Grasswren Tank, located in the northeast corner of the reserve, you might see Regent Parrot, White-browed Treecreeper, Gilbert’s Whistler, Shy Heathwren, Crested Bellbird and occasionally Black-eared Miner. White-browed and Brown Treecreeper are found near the near the Homestead Dam, and Scarlet-chested Parrot have occasionally visited the dam. The Gypsum Lunette Walk, which starts from the main Waikerie to Gluepot road about 6 km south of Emu Tank, can be very active in birdlife, and is a good walk for Black-eared Miner and Striated Grasswren. 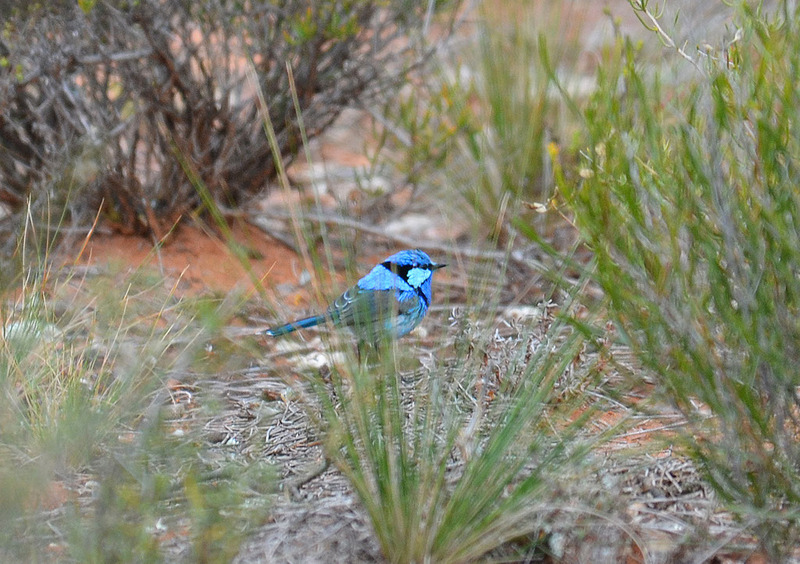 At Billiatt Conservation Park keep a look out for birds such as Malleefowl, Regent Parrot, Major Mitchell’s Cockatoo, Golden and Gilbert’s Whistler, Southern Scrub-robin, Chestnut Quail-thrush, Crested Bellbird, Black-eared Cuckoo, White-eared, Purple-gaped, Tawny-crowned, Spiny-cheeked, White-fronted and Yellow-plumed Honeyeater. While driving through the park along Lameroo-Alawoona Rd there’s plenty of areas that are worth stopping and investigating, looking, and listening for bird activity.